Size of this PNG preview of this SVG file: 481 × 599 pixels. Other resolutions: 192 × 240 pixels | 385 × 480 pixels | 481 × 600 pixels | 616 × 768 pixels | 821 × 1,024 pixels | 1,303 × 1,624 pixels. English: A typical Snellen chart. Originally developed by Dutch ophthalmologist Herman Snellen in 1862, to estimate visual acuity. 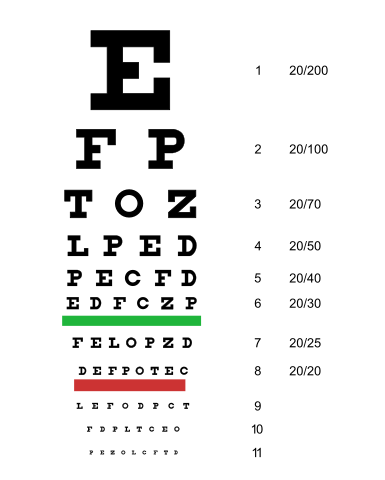 When printed out at this size, the E on line one will be 88.7 mm (3.5 inches) tall and when viewed at a distance of 20 ft (= 609.6 centimeters, or 6.09600 meters), you can estimate your eyesight based on the smallest line you can read. This page was last edited on 22 January 2016, at 22:07.